‘Complexity’ has long been recognized as a key characteristic of urban life and has recently even been proposed as the key characteristic of the city suitable to serve as an integrating paradigm for urban research generally. However, despite a widely perceived affinity between the city and both the novel and film—and the wealth of research on the city in literature and film—, the specific issue of how literary texts represent urban complexity has received little explicit scholarly attention. From the perspective of literary and cultural studies, this volume explores how urban complexity is represented in fiction, film, and other media. Geographically, almost half of the essays in this volume are concerned with New York City as arguably the epitome of the urban. Further essays offer discussions of other North American cities such as Los Angeles, Chicago, or Mexico City, as well as comparative views beyond North America. In their exploration of various facets of urban complexity, the essays cover a broad range of topics—mobility, intercultural encounters and cosmopolitanism, crime, violence and trauma, urban utopia and dystopia, socio-cultural heterogeneity, or conflicts over the use of urban space. 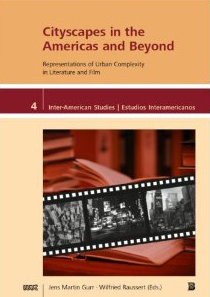 With ‘complexity’ increasingly becoming a focus of urban research across the disciplines, this volume contributes to the discussion by showing how analyses of literary and filmic urban imaginaries can point out the seismographic potential of urban cultural expression and can thus help to understand key developments in urban agglomerations in North America and beyond. This interdisciplinary series examines national and transnational issues in the cultures, societies, and histories of the Americas. It creates a forum for a critical academic dialogue between North and South, promoting an inter-American paradigm that shifts the scholarly focus from methodological nationalism to the wider context of the Western Hemisphere.